The Beautiful Branch discipleship and mentoring course is an intensive 7-Module Bible based training programme for women. The aim is to help you attain the God kind of beauty in every aspect of your life. … She is the definition of the word Beautiful. This is just to encourage you to invest in your spirit/soul by getting materials that will inspire you because many people sometimes forget to do this. Your login details will be sent to you immediately your payment is confirmed. After payment, please send an email to thebeautifulbranch@gmail.com or call +2348158867545 to supply details of your location, telephone number and postal address (where your material will be sent to). I will first like to say “Thank You” for your time, energy and the resources that went into this course. I didn’t know what exactly to expect when I signified my interest, but I thank God I did because I am now a better me. The course brought back to focus those things I’ve always known but that I’ve not been paying enough attention to. It has helped me to put my feet on the ground and determine to work the work, trusting God to supply the energy. Sharing from your experiences has also helped me to see the practicality of these things and that becoming beautiful in all aspects of life is attainable for me… and that is what I have resolved to be. The highlight of the course for me was Beautiful Spirit and Beautiful Mother. Thank you once again, God bless you ma. As a single lady, I learnt a lot from this course. My resolution is to do my best to both Spiritually and Physically remain Beautiful. Making sure I put to use all that has been impacted upon me. I see God using this course, to call forth the Beauty He has deposited in each and every one of us that are His. Making us know that there is more to just been a woman/man, both single and married. This course also made me understand that life during marriage begins when single, don’t jump the step so you don’t fall off in marriage. A lot of lessons have been learnt during the course and would say it’s been a great time. Kudos to You coach – this was a great one! My resolution is to be “Beautiful” all round. The highlight of the course for me is knowing that God wants a beautiful “me” all round and i can sure be one. 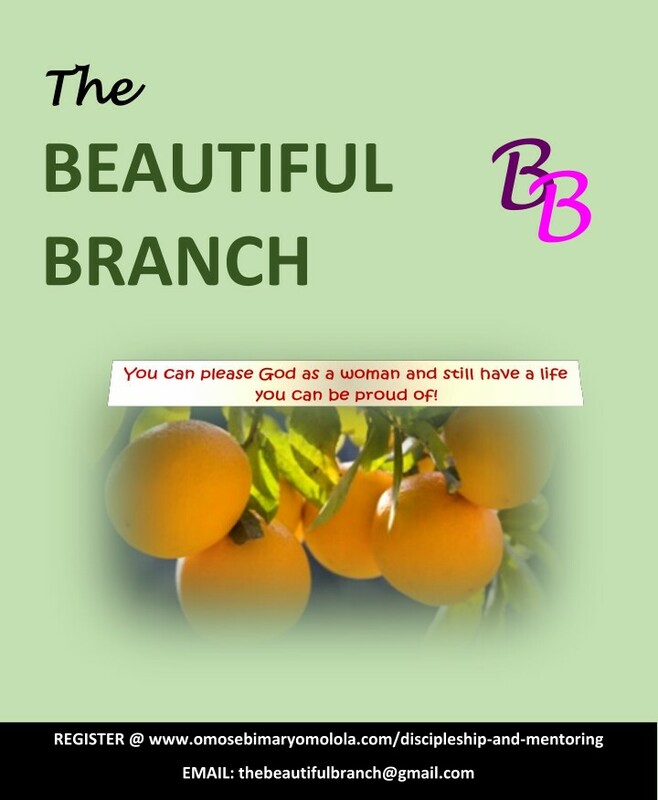 During the Beautiful Branch Discipleship Course I learnt about how to be a beautiful wife. I learnt also that the beauty the Lord has deposited in us can only be showcased through our good virtues. Also, as a woman we must stay connected to God at all times because without Him we can do nothing. We should be fill with the words of God and be beautiful in bearing forth good fruits. It has always been in me to love my husband wholeheartedly, obey his instructions and adhere strictly to God’s instructions concerning marriage. I have discovered many ways through your teachings in which I can make my home to be Heaven on earth. In order to enjoy God’s peace within my home and with all men. I really learnt a lot from this course. The course did open my eyes to traits that i have in me… My resolution is for me to be beautiful in & out. I have decided to be a beautiful wife, mother, friend, a virtuous woman, build my home and then stay connected to God in helping me achieve all this and stay true to it all. Register for this course Now by clicking on the button below.